It’s the beginning of another school year, another semester here at Harvey Mudd. 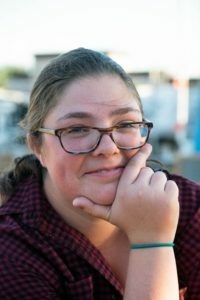 We thought you might be curious what Mudders’ schedules look like, so we asked one of our interns, Georgia Pope, to do some research for you. Below, you will find the schedules of three of the admission interns, from three different class years – sophomore, junior, and senior. Hi everyone! My name is Georgia and I am a sophomore here at Mudd. After this semester I will be almost finished with core (I say almost because I am putting off my last core class, Engineering Systems, until my junior year so that I have more time in my schedule for some new extracurriculars). 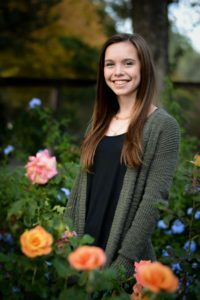 I am intending to be a Mathematical and Computational Biology major so in addition to these classes I am also hoping to do Biology research. The class that I am the most excited about, and probably also the most nervous about, is my computer science class. I think that CS is incredibly interesting and I am looking forward to learning more about the subject. 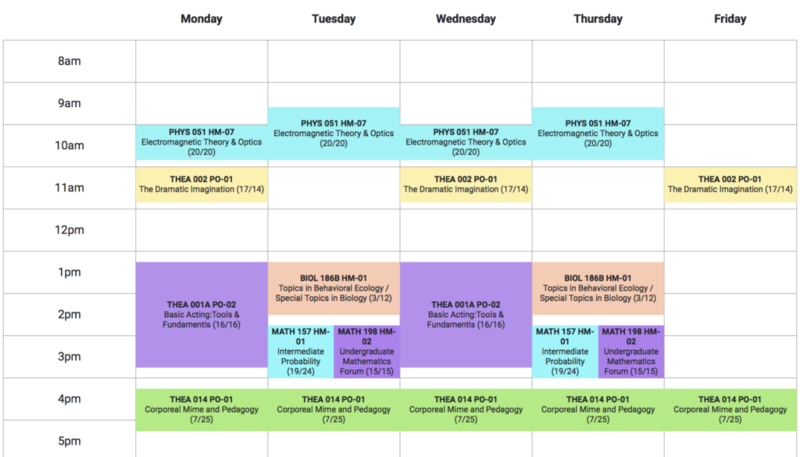 As a double major with Theatre and Math-Comp-Bio, I get to take lots of classes in lots of different disciplines every semester! Next semester I will be taking all the acting/movement classes required for my theatre major in addition to some fun math and biology courses. In addition to the classes currently visible on my calendar, I am planning on taking a PE course titled Jogging where you jog independently, registered for a Math/Comp Bio colloquium (where I get to go to lots of super interesting talks), signed up for doing tech crew on one of Pomona’s fall shows, and would love to do some sort of biology research! I’m super excited to be taking lots of classes in different subjects that all still relate to my major or core requirements I still need to complete (like Electromagnetic Theory & Optics or a PE). I am particularly looking forward to my Behavioral Ecology class, since it is a small class talking about a lot of biological topics that really interest me, and my Mime class, because I never before imagined I would ever be taking a mime class in college and I always like to try new things! 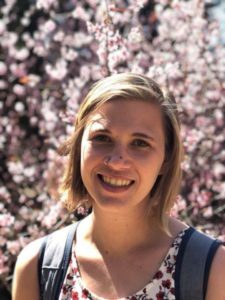 Hi, I’m also Hannah and I’m a senior chemistry major here at Mudd! 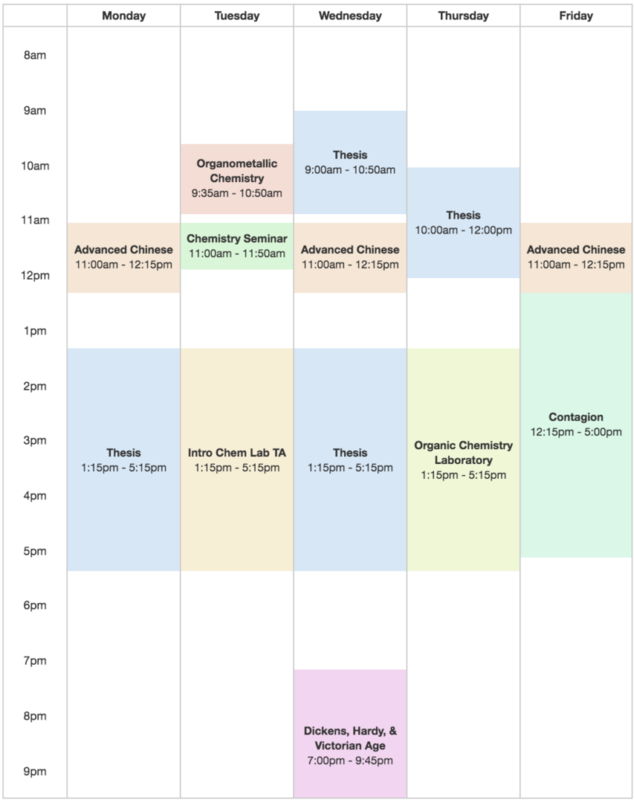 To preface this, my schedule is unusually full. Thesis alone is 12 hours of lab time per week, so I end up having a lot of class time. But, I’m still super excited about the classes I’m taking! Thesis might be what I’m most excited for, I’ll be starting a new project working on cobalt catalysts in Professor Johnson’s laboratory (where I’ve been working since sophomore year). The coolest part to me is that I will have more autonomy over my work than when I’ve just been working in the lab. Another class that I’m super excited for is Organometallic Chemistry, which is also taught by Prof Johnson. I’ve been wanting to take this since sophomore year-originally, Prof Johnson wasn’t planning on offering the course however I asked him if he would all the way back in sophomore year, so he said that since I was interested he’d offer it. Another chemistry class that I’m excited for is Contagion (I actually wrote about this course in my “Why Mudd?” application essay!). This course looks at the chemistry/biology behind contagious diseases as well as the societal impact that they bring about. This year there’s a new class format where this is actually a part of the Inside-Out Prison Exchange program, where half of the class are college students and half are prison inmates. This course is being held at Norco Men’s Prison, so an hour and a half of the scheduled class time is actually travel time. I’m really interested to see what the class will be like, I think that the inmates will have some great perspectives that might be missing from courses found on campus. Also, you might notice that I’ll be taking Organic Chemistry Lab and not Organic Chemistry; I actually took OChem last fall but had to do some funky schedule manipulation because of studying abroad which meant that I had to delay OChem lab until this year. I’m pretty excited for the lab though, I hope to go into synthetic organic chemistry someday, so I think that the lab will have some very interesting and relevant information for me! My last chemistry class is chemistry seminar, which is required for all juniors and seniors and basically is a course with guest lecturers every week. I’ve been able to hear about some great labs at other schools through these lectures so I look forward to who might be visiting this time around. I’m also taking two courses in the Humanities/Social Sciences/Arts (HSAs): Advanced Chinese and Dickens, Hardy & the Victorian Era. I’ve been taking Chinese since freshman year over at Pomona (it’s my HSA concentration) and I made a lot of progress on my Chinese language skills last semester when I was abroad in Kunming, China (you can hear more about my abroad experiences on our Voices Abroad page!). I’m going to continue taking Chinese so I can keep improving my ability to speak and read in Chinese. Dickens, Hardy & the Victorian Era is a really cool class offered here where during the fall semester we study a number of books written by Dickens and Hardy, then during winter break we spend two weeks traveling to the places that they wrote about. People always love this course and I love traveling so I’m really excited about taking this course! You’ll also see Intro Chem Lab TA on my schedule (which is exactly what it sounds like), but technically this isn’t a class, I’m actually getting paid. I think it’s pretty neat to be able to help out in a fun class like intro chem lab and get paid at the same time! 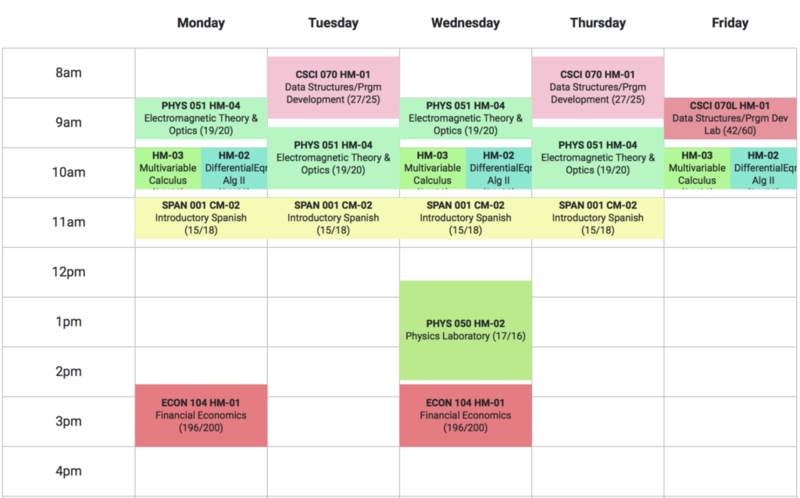 All in all, I think I’m going to have a great semester.